Nouveau New Orleans Red Beans and Rice | Good. Food. Stories. We’re in the thick of Carnival season here in New Orleans, leading up to Mardi Gras. Mardi Gras, French for “fat Tuesday,” is the tradition of feasting decadently the night before Lent begins. Dishes like jambalaya, gumbo, seafood étouffée, shrimp and grits, and maque choux are typical of what you might find at a New Orleans Mardi Gras dinner—and don’t forget king cake for dessert. My absolute favorite Mardi Gras food, though—hell, my favorite New Orleans food—is humble, really. I am an absolute die-hard fan of the ultimate Creole comfort food, New Orleans red beans and rice. You can get traditional red beans and rice in almost any restaurant in New Orleans (not to mention many bars on Monday nights), and recipes for it abound. In fact, ask how to make it in New Orleans and you’ll get as many different answers as people you ask. But nearly everyone agrees about why the tradition is to eat red beans and rice on Mondays. Made with the pork bones left over from Sunday night dinner, a pot of beans could simmer on the stovetop all day on Monday, unattended—a necessity, because Monday was laundry day and there was no time to spend in the kitchen. 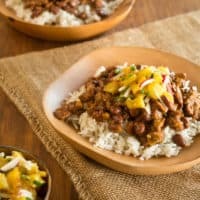 Beans and rice were cheap, too, and flavored by the bones, whatever amount of leftover meat was on hand, and a low, slow simmer, they could make a delicious meal for pennies and with hardly any effort. But … lez be honest: I barely ever do the laundry and I’m not ever going to have a ham hock on hand. My version of the dish is something I can make with things I really do almost always have in my fridge and freezer, and it doesn’t take all day to cook. Besides, Mardi Gras, though certainly a tradition, is all about mixing it up—putting your own spin on things. Kidney beans made their way to New Orleans with white French Creoles from Haiti who fled during the Haitian Revolution (1791-1804). 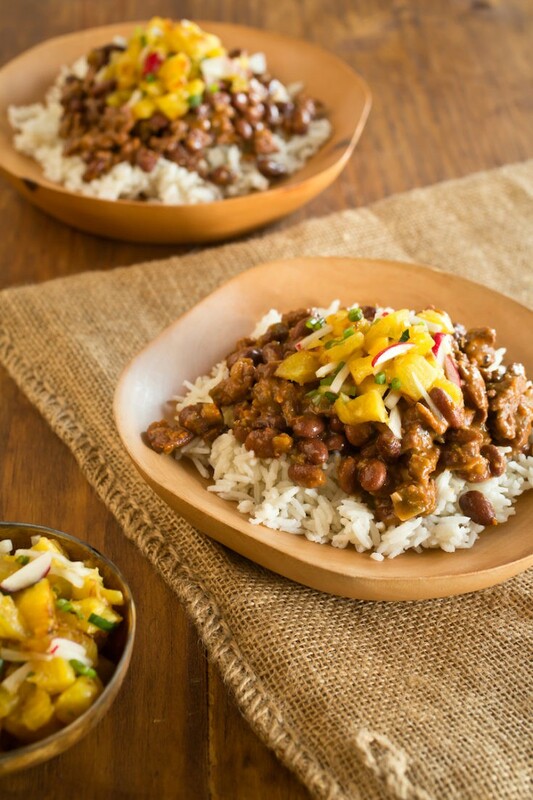 My version of red beans and rice tips its hat to the dish’s Caribbean influences. It’s lighter, brighter, and faster, thought it retains the same heartiness and rich, smoky flavor profile as the traditional dish. Rather than getting its smoke from cooking the beans with a ham hock, though, mine gets it from smoky bacon and dry-grilling the vegetables before they go in the pot. Rather than large pieces of sausage, I use ground meat that suffuses every bite. And in addition to the comfort of rice, my version also gets a wake-up call from a super fresh pineapple salsa. Want to get really decadent? Grate smoked gouda on top and let it melt into the beans and rice and I promise it’ll be a Mardi Gras parade in your mouth … um, without the hangover the next morning. Laissez les bons temps rouler! 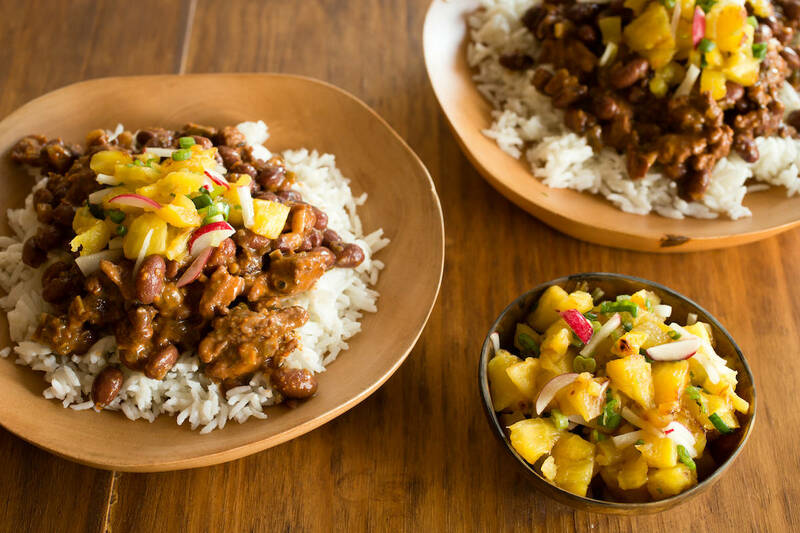 New Orleans red beans and rice is a longstanding tradition, but this quick-simmered version offers a bright pineapple salsa on the side for lightness. Add the beans to a medium (3-4 quart) stockpot and fill with water. Bring to a boil and cook uncovered until the beans are softened, about an hour and a half. Mostly you can just leave these boiling, but check from time to time and add more water if necessary. I like to put the teakettle on so that I have hot water to add, which doesn't lower the temperature and take longer to cook. While your beans are boiling, heat a grill pan or cast iron skillet over medium high heat. Grill the onion, pepper, and celery—searing them in a dry grill pan gives them beautiful black sear marks and lets the smokiness come through in the dish. Remove from the pan once they're charred and slightly softened and place on a cutting board. Once cool enough to handle, chop the grilled vegetables and set aside. When the beans are softened, drain in a colander or strainer and set aside. Return the pot to the stove over medium heat and add the bacon. Cook, stirring frequently, until the bacon is crispy and has rendered its fat. Scoop out the bacon pieces with a slotted spoon or tongs and set aside, leaving the fat in the pot. Stir in the thyme, paprika, chipotle, cayenne, red pepper flakes, salt, and pepper and cook for just a bit more—make sure not to burn the garlic at this stage, since you'll cook the heck out of the whole pot in a little while. Bring the heat back up to medium and add the ground turkey or pork. Brown the meat, stirring to break it up into small pieces. Add a slug of bourbon to the pot for sweetness (and one for the cook--it's only polite) along with the cooked beans, grilled vegetables, and bacon. Drop in the bouillon cube, stir everything together, and add just enough water to cover the whole mess. Cover, bring to a boil, then reduce the heat slightly and let simmer for about 20 minutes, stirring occasionally and adjusting your seasonings to your taste. If you need to, just add water until everything has cooked together to the consistency you want. While the beans simmer, cook the rice in your preferred method, whether that's a rice cooker, a pressure or multi cooker, or on the stovetop. An easy way is to bring 2 cups of water for every 1 cup rice to a boil, then add the rice, cover, and reduce to a simmer. Cook undisturbed for about 20 minutes, until the rice has absorbed the water. Let rest, covered, for 10 minutes, then fluff with a fork. To grill the pineapple (totally optional), reheat the same grill pan or skillet that you used for the onions and peppers—the flavors are all mingling in your bowl anyway. Pat the pineapple slices dry and cook for two or three minutes on each side, until the fruit begins to caramelize and char. Chop the pineapple and stir with the scallions, radishes, and garlic in a bowl. 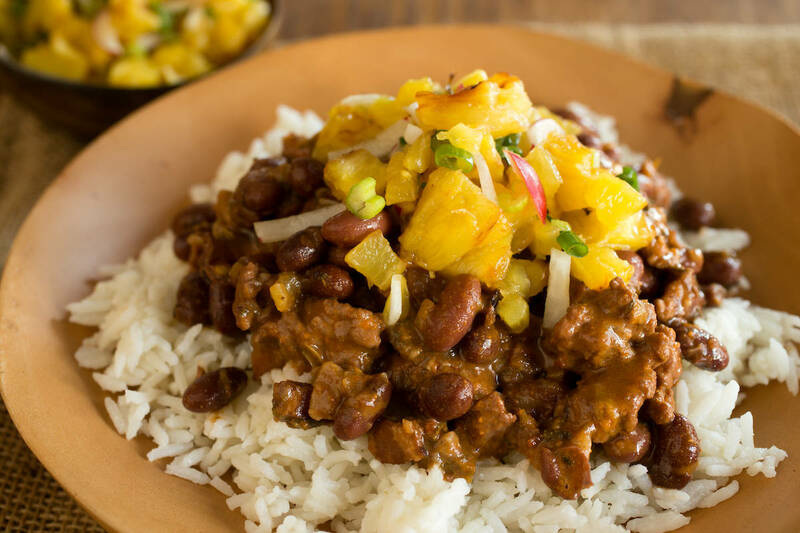 Ladle the beans over the rice, and top with the grated smoked gouda, a sprinkle of parsley, and a dollop of pineapple salsa—then prepare to feel like the Rex of the Carnival. Beans can be boiled up to 2 days in advance. Refrigerate in their cooking liquid, then drain before returning to the pan with the other ingredients.